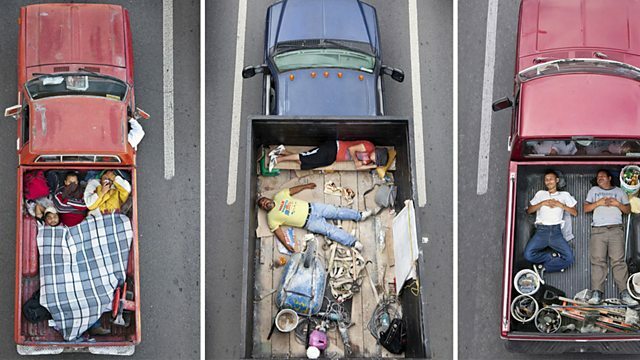 The photographer Alejandro Cartagena spent over a year photographing Mexican car poolers. The photographer Alejandro Cartagena spent over a year photographing Mexican car poolers as they commute in from the urban spread around Monterrey Mexico. James Lasdun was a lecturer in creative writing who found himself being stalked by a former student. Moving from mild to serious harassment and threats, it's lasted five years now. Director Dylan Gray joins us to talk about Fire In The Blood, his extraordinary documentary which tells the story of how a small group of activists made cheap antiretroviral drugs available to people with HIV in the third world. James Lasdun was a lecturer who found himself being stalked by a former student.